The St. Mark's Choir performs at Westminster Abbey in London, England. 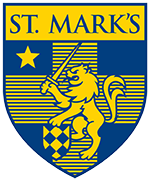 Opportunities to participate in the Choral Music Program at St. Mark’s begin with the 4th Grade Novice (training) Choir, and continues into Upper School. Assistant Choirmaster and Organist Glenn Stroh works with the Novice Choir, training them in the Royal School of Church Music curriculum, and Choirmaster Tinsley Silcox teaches the 5th/6th, 7th/8th, and Upper School Choirs, preparing for services and concerts and continuing their training in RSCM. The Choir sings throughout the year in Chapel services, and sings regular services of Choral Evensong in the Anglican Church choral tradition throughout the school year. The Choir also sings a service of Lessons & Carols every December—a tradition that has continued for more than 60 years at St. Mark’s—and a Spring Concert with music chosen by the choristers themselves. The Choir participates in a biennial international tour, singing in the great cathedrals of England, and visiting countries such as South Africa. The Upper School Choir participates annually in the ISAS Fine Arts Festival, and sings the national anthem at local sporting events, such as for a Dallas Mavericks basketball game and for a Texas Rangers baseball game.